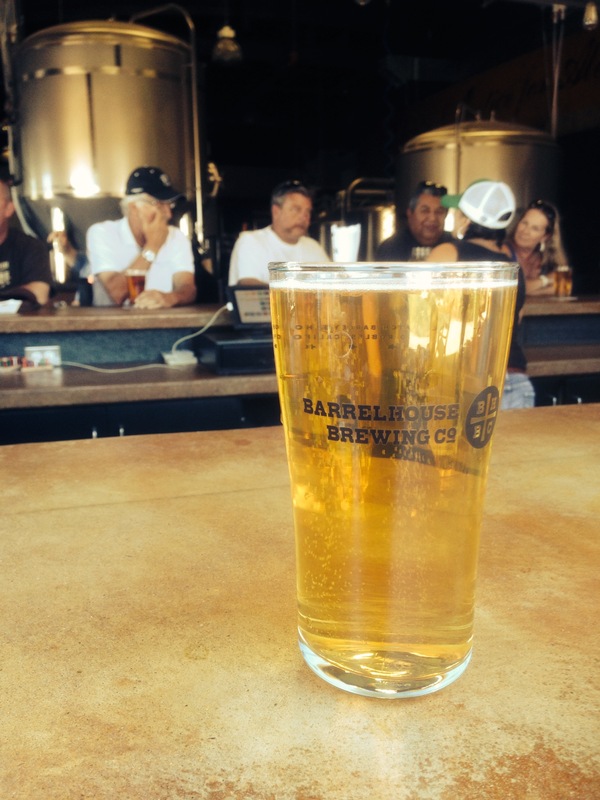 Paso Robles – Barrelhouse Brewing Co.
Just a solo visit, my bride couldn’t make the trip. Nice warm day in Paso, about 100 degrees but dry and a nice breeze. Besides having some very nice beers they have a “lovely” grounds area. When I say lovely, I mean it in the Australian sense! The British application of the word fits! Using “British” may irritate some of my Australian friends, but, they have accused me of being an Anglophile! The first time I heard the Australian us of “lovely” was from a well dressed bloke in Sydney describing a nearby Steakhouse! So let’s say the grounds are appealing and more than just acceptable, though my wife might say “cute”. I really like the garden chairs, the picnic tables, the fountain and today- the old flat bed truck converted to a stage. Yes, live music, live music California style, i.e., the rhythm guitar player in a tank top, shorts and barefoot! A look across the grounds. I spent last week in California, more precisely, Coalinga, Paso Robles, Bakersfield and San Ardo. 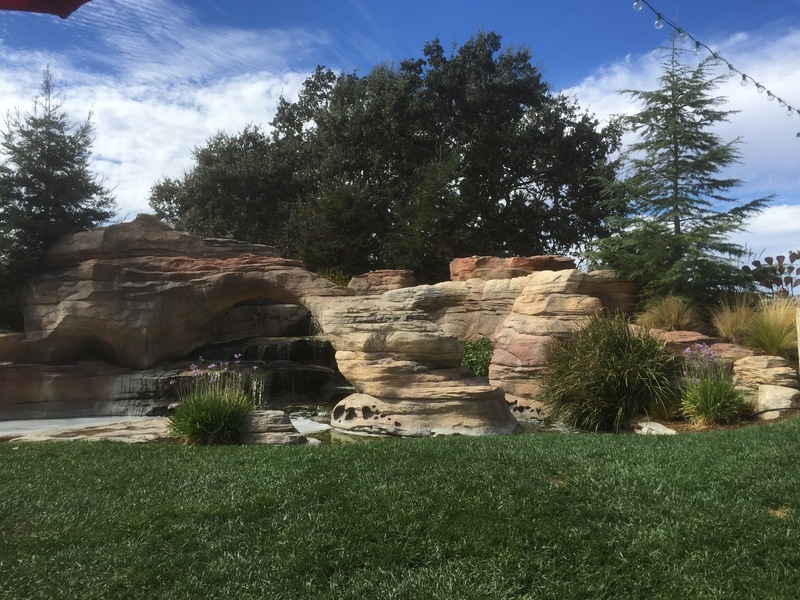 In Coalinga we stayed at Harris Ranch Inn. Great beef, great ranch style rooms and good beer to. Tuesday night we shifted locations to Paso Robles, 27 minutes south of San Ardo oilfield. We were in the midst of some of the finest red wine growing and nearly 300 wineries, from little tiny to very, very big! Just a note, we should have had a 27 minute drive but due to cattle guard issues with a local rancher and some drilling activity we had to drive another 8 or 10 minutes north, hook back across the Salinas River and meander through some lush produce fields adding 15 minutes to the drive. We witnessed seemingly endless vistas of vineyards, cattle grazing on the rolling hills, cabbage harvests and lettuce planting….This stretch of Highway 101, El Camino Real that parallels the freeway is the most amazing display of the earth’s bounty. 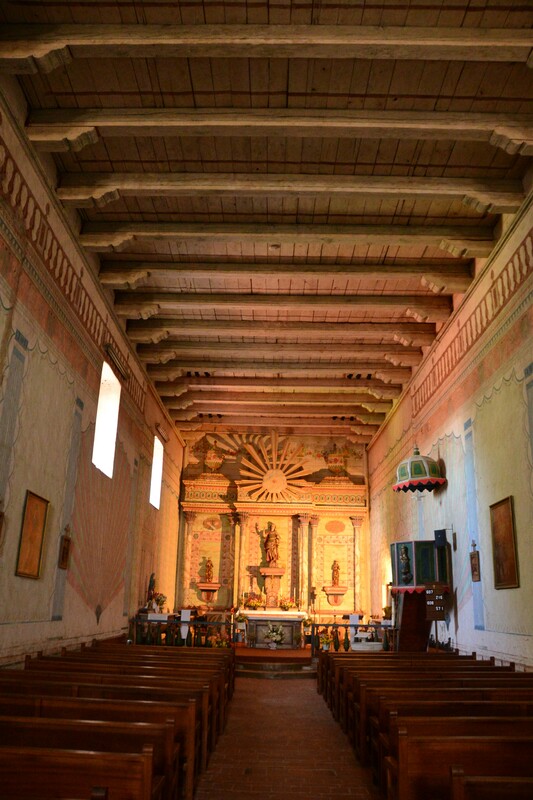 The altar at the San Miguel Mission near Paso Robles. Built in 1794! My workmate, Murray and I had worked in the region this past December. While in Paso Robles we dined at the pub associated with the Firestone Walker Brewery. Great beer and now great food to boot. We treated ourselves in December to a bottle of Parabola, a barrel aged Imperial Stout. We shared the 2011 “vintage” – I think it is ok to use that term since we are in an incredible wine growing region! The 2011 bottle was amazing! We both agreed that it treated the senses to a mouth feel, taste and aroma that could be used to describe a great Port! I would love to have hauled an unopened bottle back to Texas but they wouldn’t agree to sell one to me for that purpose. I tried to explain that I was Bishop Decker, world famous beer drinker and blogger extraordinaire! I guess my fame is restricted to Texas! 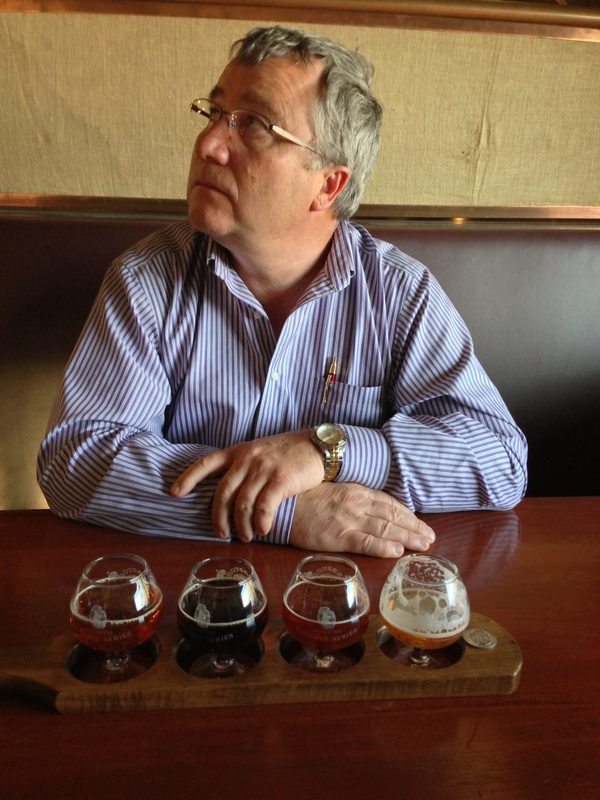 Murray’s good side with his 4 beer sampler at Firestone Walker Pub. Surrounded my great wines, vineyards and wineries, so what do Murray and I drink? Beer!! 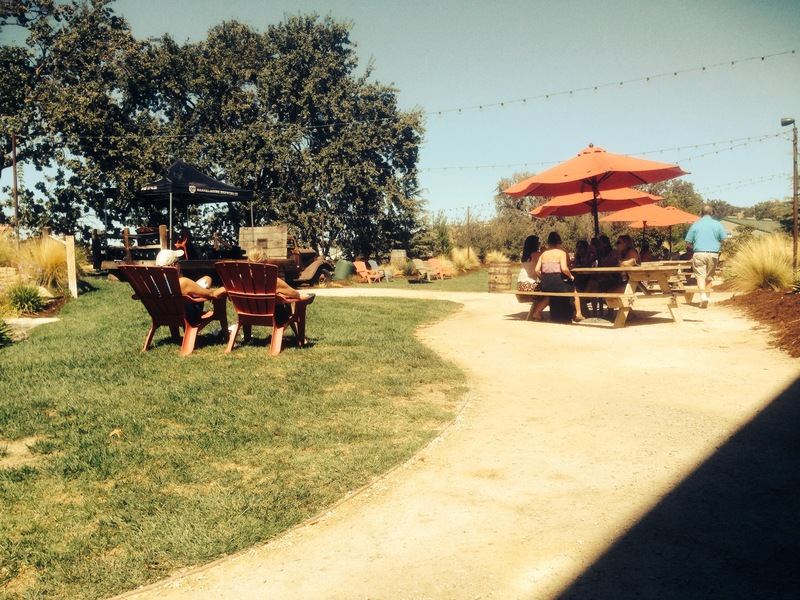 We had the DBA, the 805, a 4 beer sampler – see Murray’s good side, and of course the Parabola. Rules seem to have change or maybe Murray and his west coast of Canada charm worked some magic – the rascal convinced them to sell him a bottle of the 2011 Parabola in a “to-go” box. In fact it was the last bottle and stamped as the No. 2 bottle from that batch. We shared the 2013 bottling on the advice of our server….he said the 2012 was a bit too sweet. The 2013 is superb! I treated Murray to a dinner with my Mother on Wednesday night at her favorite seafood place in Morro Bay. She ordered her favorite meal – the chicken breast – FYI the old gal doesn’t eat fish. She was her usual perky self at 84-ish. She conducts a Tai Chi class 3 days per week – as much a social gathering as it is fitness – a mix of mind and body. PS – Mom, Murray thinks you are pretty special. I hesitated putting that comment in because it could go to her Head!!!! Friday we trekked back to Bakersfield the long way, through Santa Maria, similar vistas as the 101 north of Paso Robles but now strawberry fields add to the mix. We took Highway 166 through Cuyama…endless vistas of carrot fields! We continued our beer sampling at Lengthwise Pub out on Calloway in Bakersfield with their Centennial IPA. Saturday on the plane very early, fingers crossed for an on time flight….My youngest son was graduating High School with over 600 of his classmates. 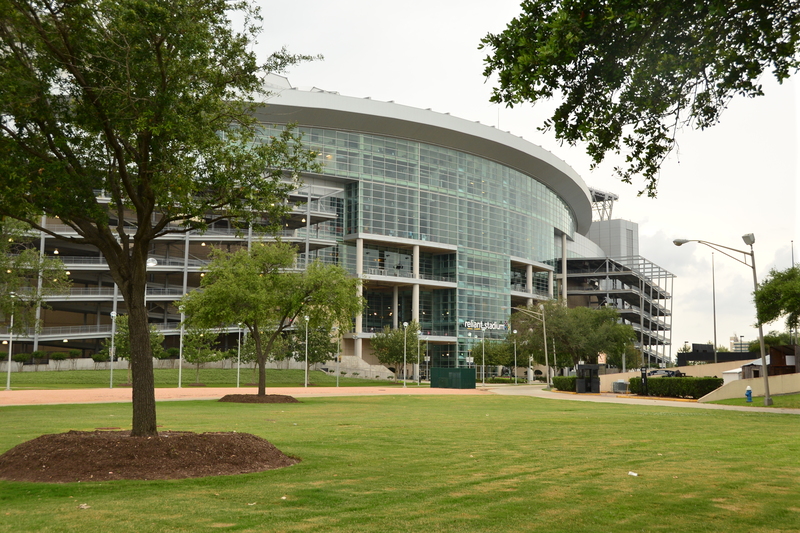 The event was held in one half of Reliant Stadium…the same place that the NFL Texans play their games! At the celebratory graduation I tried a bottle of beer from Bear Republic, Red Rocket Ale – I really liked it!!!!!! Drink Local and Drink Responsibly – I am sipping on a Sierra Nevada Celebration Ale as I write….made with fresh hops…Murray has promised to bring me some fresh hops for my home brewing efforts next fall – Grown on the island of his residence, Salt Spring BC – said that he would supply me a kilo of the good stuff! A KILO OF HOPS Y’ALL!!!!! 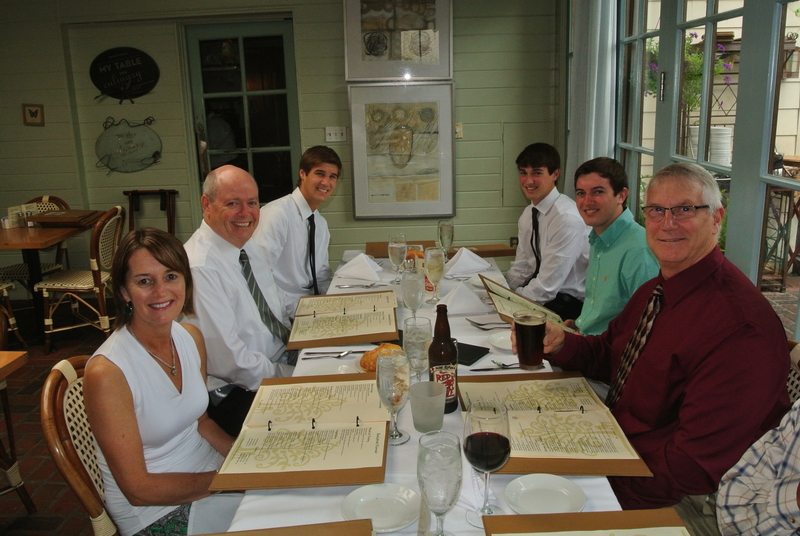 Dinner at son Joe’s graduation – he is far left, my big maroon body with my Red Rocket Ale is near right. My beer blogging efforts have been pretty slim over the past month or so but that does not mean I haven’t thought about, dreamed about, consumed or made any beer. 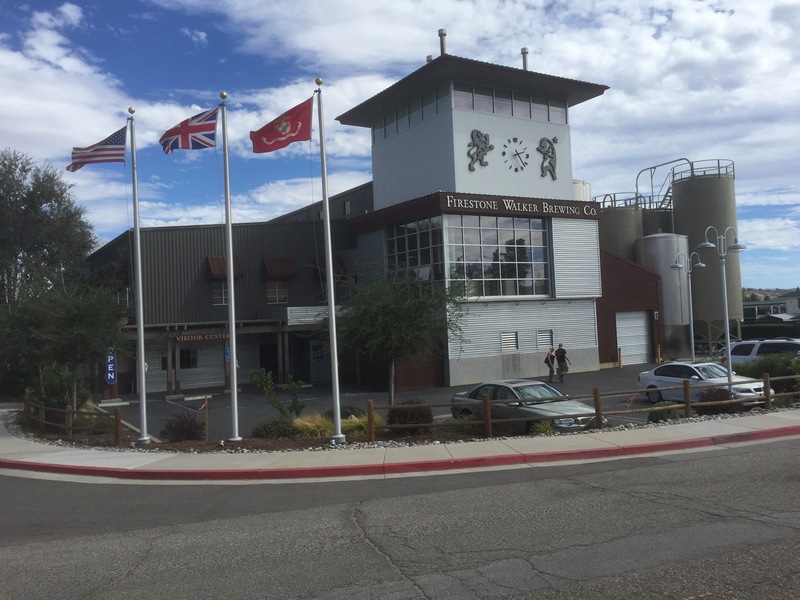 I have been traveling, primarily to Bakersfield California, home of Lengthwise Brewing. I am a big fan of their Centennial IPA. It is not crazy hoppy, just a great balance of the bitter and the aromas. I have visited the pub out in the Rosedale area three times during this past month. Besides their offerings they always have a few guest beers from the western US. One of the guest beers was the Hop Notch form Uinita Brewing in Salt Lake City, Utah. Good but not as good as the home town offering! 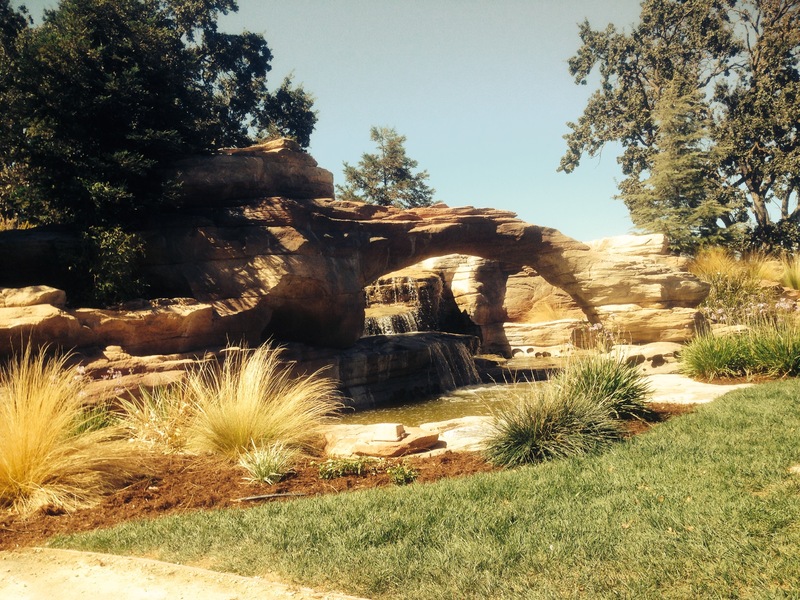 This past week I was in Paso Robles for two nights. My occasional workmate, Alan would have been right in his element. Paso is becoming one of the best red wine districts in the country. 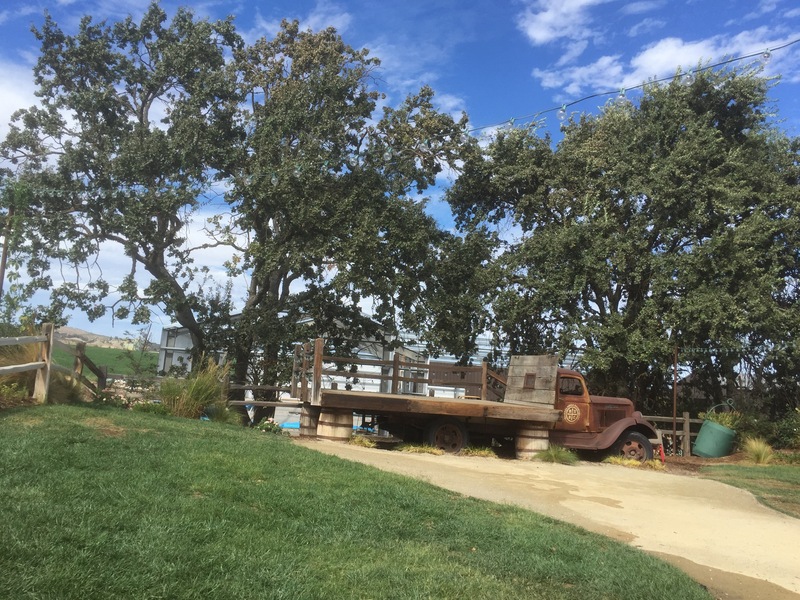 For Alan, the Paso area would be reminiscent of our experience in the Margret River area in Western Australia….great wines, no crowds and a great tasting room experience – The Paso winery for fun, great wine and great service is Tobin James. Isn’t this supposed to be about beer? Oh yes, Paso, home to Firestone Walker and that is the real story. I have enjoyed the Firestone offerings for many years now but have never made the stop. This trip my partner was Murray and he does love his beer. We went to the Taproom Restaurant adjacent to the brewery. It was a great casual place, brewery themed and staffed by some great people. Tiffani was assigned to us and she was delightful, knowledgeable and provided outstanding service. I started off with the Taproom IPA. How would my kids text it?….OMG!!!! ….. That sums it up. The first thing that I noticed was the heavenly hop aroma before it even touched my lips, I paused, savored the aroma and then let my tongue enjoy the beverage. I then tried the Velvet Merlin, an Oatmeal Stout, recommended by Erica at the Courtyard Marriott hotel. It was pretty darned good. Tiffani recommended the seared Ahi Tuna which Murray ordered and I chose the salmon. Both were excellent. The only question that went unanswered for the evening was which hops were used in the Taproom IPA. Tiffani didn’t know, the brewmaster had headed home 30 minutes before our arrival, Rob the manager also didn’t know and last but not least, Milt (capacity unknown) swung by and although very chatty, he didn’t know either! Tiffani brought by two small brandy snifters of a barrel aged DBA – oh my – it was superb. Now our interest was piqued and I asked about the Walker Reserve, Parabola, a barrel aged Imperial Stout – the 2011 was $ 55.00 for a 22 oz bottle and the 2012 was $ 35.00. We decide to go big! Before I could ask where I could buy it on the outside I was informed that I couldn’t…it has to be sold and consumed on site. It was absolutely outstanding. Murray noted that was akin to indulging in a very good Port after dinner. It felt so good in the mouth and the complexity of flavors was heavenly. All we needed was some good dark chocolate and it would have been complete. Note: Alan, the only non-beer drinking Australian I know, you would enjoy this “beer” – it really goes well beyond beer, We shared a glass with Tiffani, I hope the management won’t frown on her sharing a bit of this fantastic bottle! 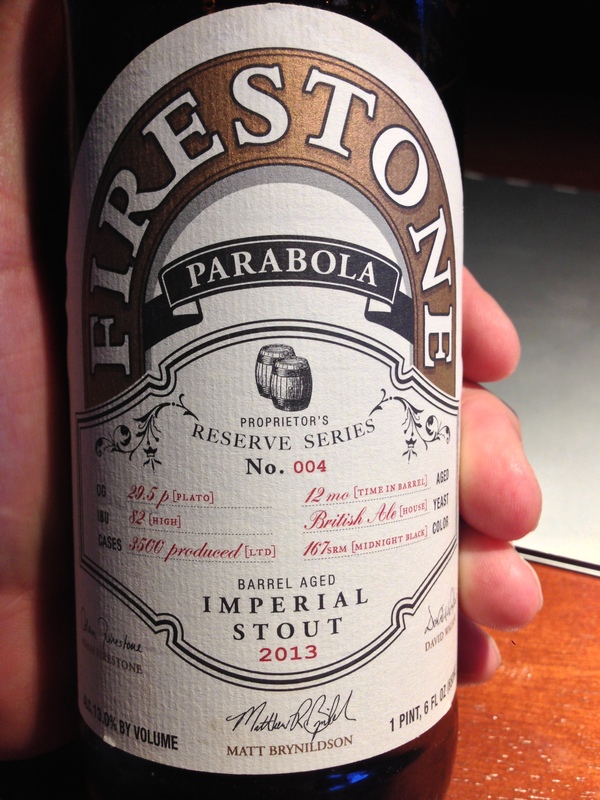 A quick google search for the best barrel aged Imperial Stouts showed the Firestone Walker’s Parabola in first place amongst the voters and Goose Island from Chicago holding down the second place spot. I need to contact my nephew in Chicago to see if he can score a bottle or two for me! I am drinking a test bottle of the Imperial Stout I brewed about 4 months ago. It is pretty tasty but will benefit from a few more months in the bottle. I will rack my Cinderella Pumpkin Ale to the secondary tomorrow. I have high expectations of this brew. Reading beer mags during the past week I discovered a brewing technique that I want to explore….. SmaSh brewing……single malt, single hop with a variation of maybe a single specialty grain…..could be an interesting experiment! My young Imperial Stout – yum but has some time to go! Drink Local and Drink Responsibly!